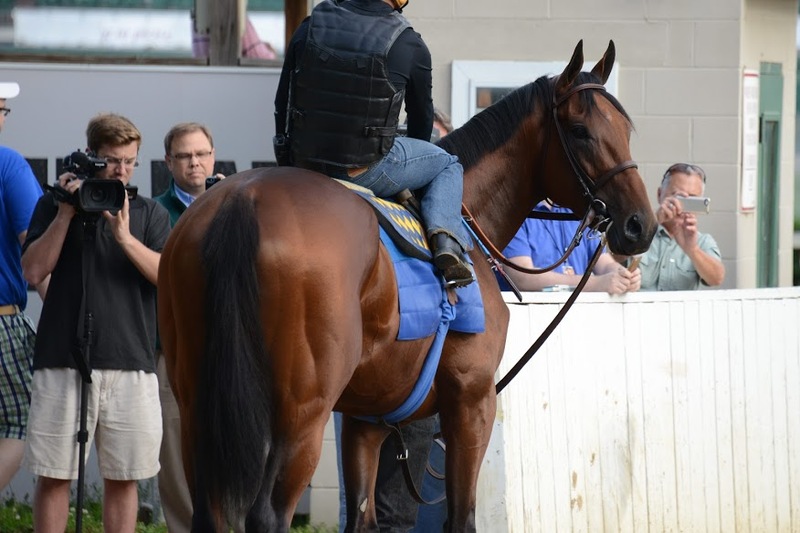 After Memorial day we needed some cheer, and in the way of the ebbs and flows of life, Tuesday brought smiles, thanks to Bob Baffert and Dana Barnes, who invited the Old Friends crew to Churchill Downs to watch American Pharoah work. The adventure began bright and early when we met at the farm, piled into a few cars and headed for Louisville. Our car, carrying a passenger whose deep knowledge and love for Pharoah’s family goes back to Dr. Fager, favored speed (you know who you are), but the Blowen & White car made a late stretch run. Or else they took a short cut. Anyway, the timing was perfect. 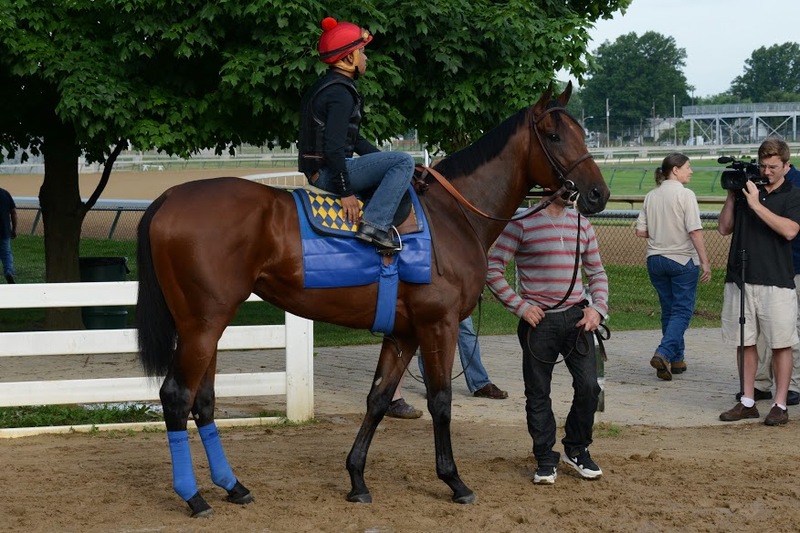 The Baffert team was hard at work, but American Pharoah had not yet made his appearance. All photos by Laura Battles. When he did, those who’d gathered to watch fell silent. It was a silence of attentive observation. Of speculation. Of respect. The Pharoah stepped out of his shed row with all the curious interest of the youngster he is, but with absolute confidence. He was relaxed, and he was focused. For this work, his rider was jockey Martin Garcia. As they waited to walk the short distance to the track, with American Pharoah standing still, I was struck by how adolescent this colt’s physique still is. But judging from what we saw, his mind is impressively mature. His demeanor, before, during and after the work, was spirited yet self-possessed, businesslike yet my impression was of a horse not only willing but kind. 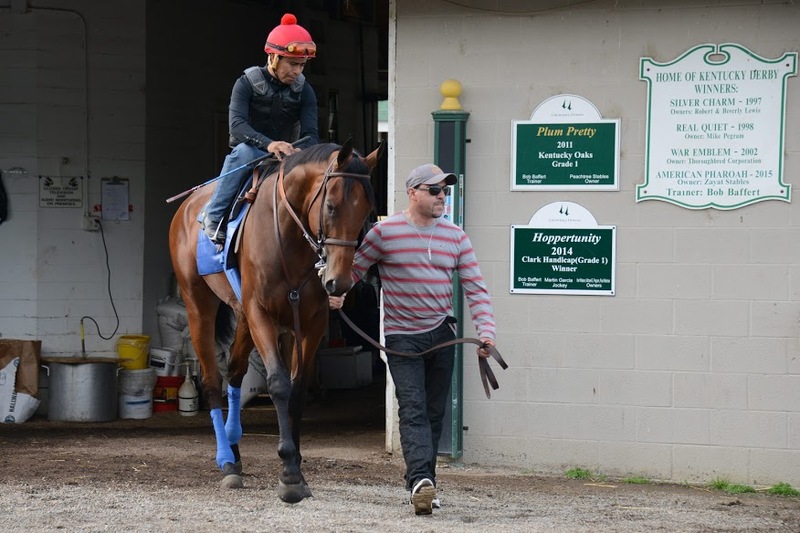 And in motion, American Pharoah is pure grace, as he showed us soon as he set off down the track. What can I say? Any description would sound like what you’ve already read about this colt’s athleticism, his sweeping strides and the incredibly smooth way he moved, as fluid as liquid being poured. The most telling thing is that we gawkers in the bleachers, even the people with exercise rider helmets, thought he wasn’t going all that fast—until someone announced his time. Then, a collective murmur went up. He followed with a good gallop out, and as they came past, the colt was doing his best to respond to Martin Garcia’s soothing, “Whoa, whoa,” in time with his strides and breathing, though you could tell it was hard to do when he felt he hadn’t really run yet. Of course, he hadn’t. It was all about maintenance, keeping him fit and well, relaxed, happy, but yearning to let out all the stops. 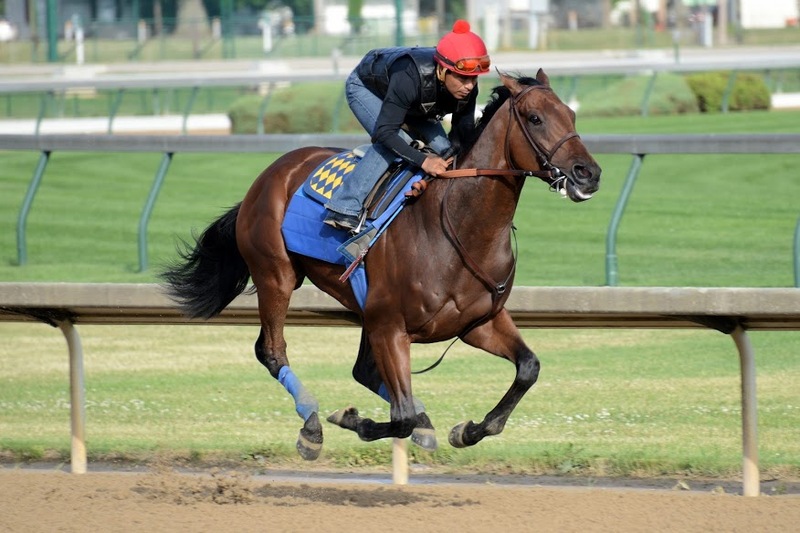 I came away with the impression that whoever wins the Belmont next Saturday, American Pharoah would make a fully worthy Triple Crown winner. 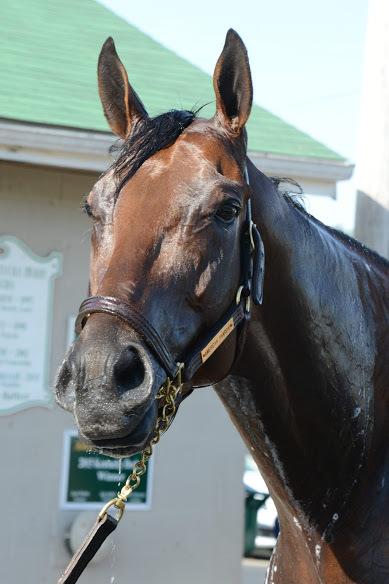 I don’t always feel that with every Derby & Preakness winner, but I do this time. Well, these are just my impressions. 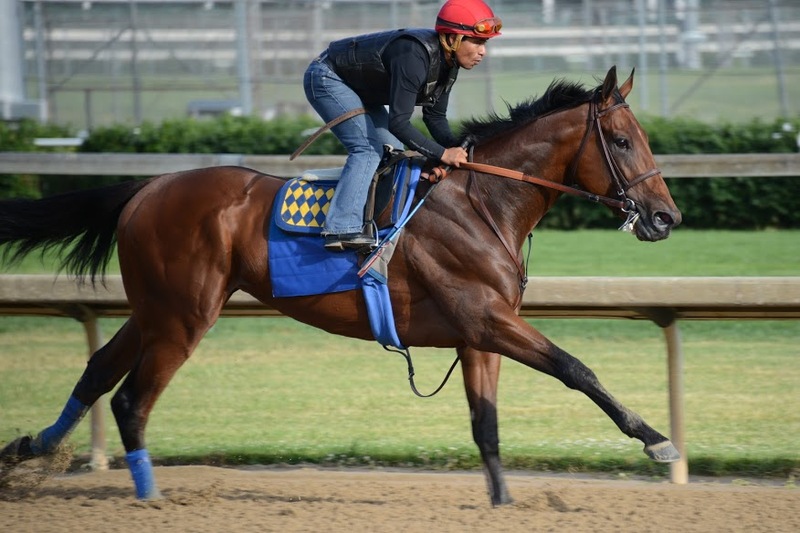 If you want the stats, see the Bloodhorse’s coverage of this work. 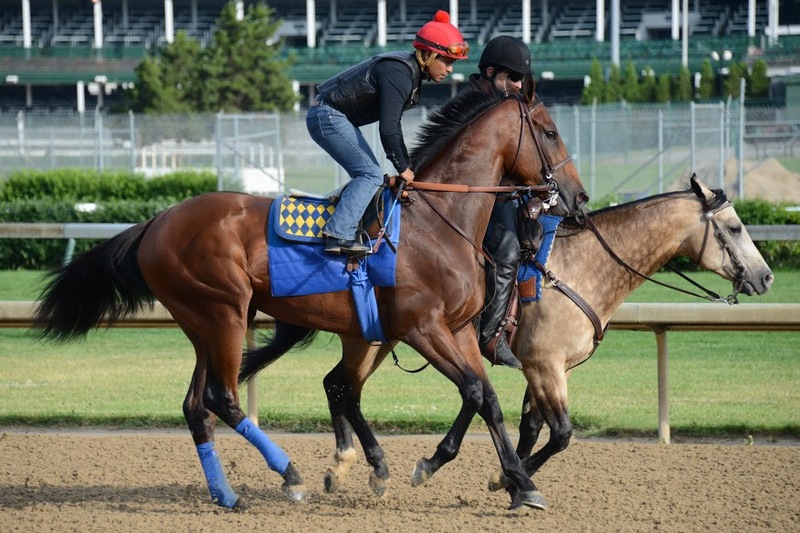 At the bottom of the article, you’ll find a few minutes of the interview Mr. Baffert gave afterward while most of us were watching American Pharaoh get his bath (you may catch glimpses of a couple of familiar faces in the background…). Best of all, though, are Laura’s wonderful impressions of this memorable day. A little bit of play. It was good to spend happy time together, to look to the future with hopeful anticipation, and to enjoy a few moments in the life of a youngster at the top of the game we so much admire our retirees for playing in their day. Many, many thanks from the Old Friends folks to Mr. Baffert and his team for allowing us to see, up close on the backside, an extraordinary young horse doing what our retirees used to do, and doing it superbly.